Few car design concepts divide an audience more than the wagon. Some see wagons as nothing more than family cars and grocery getters, while others consider them a uniquely sporty aesthetic. 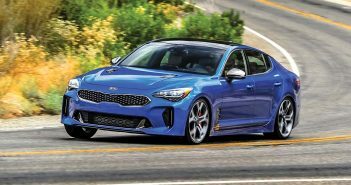 More recently, wagons and hatchbacks have evolved into a somewhat popular design for a niche audience, but there are still plenty who refuse to call anything with added cargo volume a performance car. Either way, the sight of an R34 front end on a station wagon at the drag strip is enough for anyone to have to double-take. Little more than a decade ago, Shinji Okuda was on a hunt for a car that could comfortably get around the city but also fly down the quarter-mile. His eyes were stuck on the acclaimed Nissan GT-R, but then a unique idea came to mind. He began investigating the WC34 Nissan Stagea, envisioning the platform’s flexibility in interchanging parts with the GT-R to build something truly unique and still impressively quick. The Nissan Stagea first entered the market in 1996 to compete with the Subaru Legacy Touring wagon. The first generation model, labelled WC34, was made available with multiple engine and drivetrain configurations, including an RB26 2.6-liter twin cam, twin turbo setup that claimed 276 horsepower, and the option of AWD or RWD on select models. Many of the Stagea’s exterior components share design cues with the R34 GT-R, while the platform underneath carries over many of the R33 GT-R components. The Stagea went through multiple changes and redesigns, lasting through three model generations from 1996 to 2007. Given the car’s strong ties to the GT-R models, it only makes sense that “GT-R wagon” builds occasionally pop up. Okuda’s Stagea first came with a 2.5-liter non-turbo engine, but this was of no concern as an engine swap was part of the plan before the build even started. 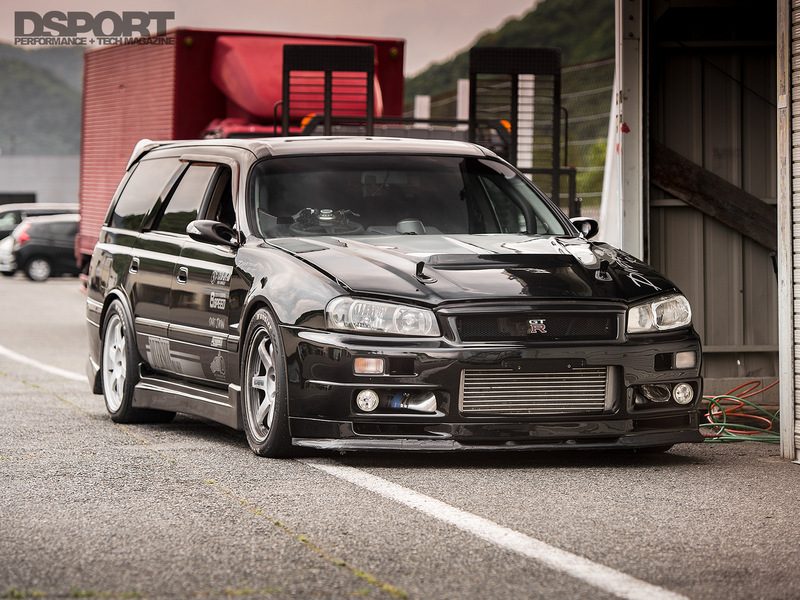 Given that he was initially eyeing the GT-R, the Stagea provided him a streetable platform that could still take heavy influence from the GT-R. This included plans to change the car’s appearance to match that of the R34, and to even swap in a turbocharged RB26. Okuda and his team, Diversion, put their heads together to build and execute a plan. With the Stagea in their hands and prepped for surgery, the team’s work started with the engine. The original 2.5-liter motor was removed to make room for the N1 RB26 block that the car uses today. 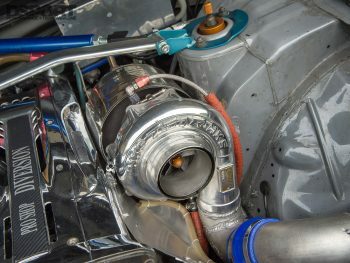 The RB26 pulls intake air through a Diversion 6 Throttle 45 Pie throttle body, with the help of an HKS T51R SPL ball bearing turbocharger and Trust intercooler. The T51R SPL turbo is a Garrett-based unit, utilizing reengineered compressor and turbine wheels to bring power levels up to and beyond 1,000 horsepower. The high capabilities of the turbo need to be looked after and managed appropriately, so the team installed a Trust Profec Boost Controller and Trust Type C Wastegate to handle the output. The charged air reaches the cylinders through the head and valvetrain assembly utilizing HKS 280 intake and 272 exhaust camshafts. 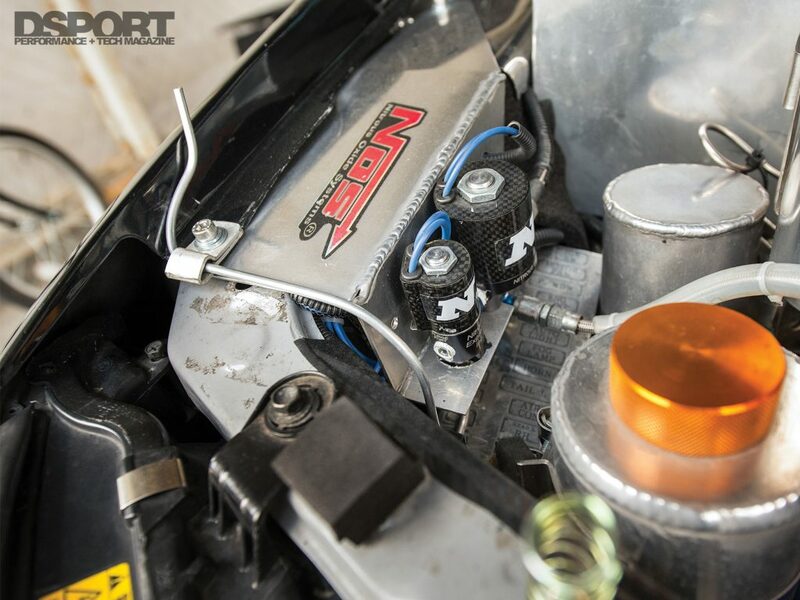 The head clamps to the top of the block, sealed with an HKS Drag Series Metal Head Gasket. The Nitrous Oxide Systems’ solenoids control fuel and nitrous for optimal flow and operation under wide-open throttle conditions. 110 octane HKS Drag Gas reaches the cylinders by way of a single NISMO and twin Bosch fuel pump combo, distributed through 1,000cc injectors. In order to assemble the right mixture with ideal timing, an HKS F-Con V Pro 4.1 controls the fuel and ignition components. An HKS Twin Power ignition delivers extra power to the NGK spark plugs to keep up with the higher air and fuel supply. In order to handle the greater forces at work inside the block, the Diversion team employed HKS connecting rods and TOMEI Powered pistons on the rotating assembly. Spent gases leave the block through a Top Secret exhaust manifold and Diversion’s own exhaust system. When the Stagea’s RB26 fires up, it lays down approximately 1,085 horsepower according to the Bosch chassis dyno. 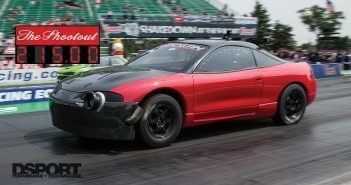 The 1,000+ horsepower figure and intent to drag race would be far too much for the factory clutch and gearbox to handle. In search of a more capable combination, Okuda and the Diversion team turned to OS Giken. OS Giken’s R Clutch series is the manufacturer’s highest capacity option, designed with a floating center hub built to withstand hard driving and high horsepower. To this end, they selected OS Giken’s R3C clutch to send the power through the drivetrain. The highly-capable engine required a gearbox to match, so Okuda opted for OS Giken’s OS-88 Sequential Transmission. This transmission offers six gears in a reinforced case to withstand up to 1,500 horsepower. 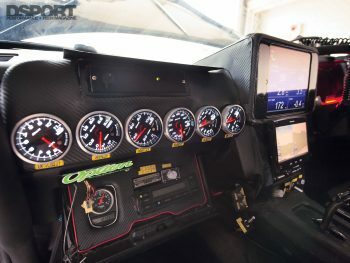 Taking full advantage of the reduced shift times, Okuda implemented an ignition cutoff that is synchronized with the clutch, allowing for no-lift-shifts. In order to keep the power distributed optimally to all four wheels, a Cusco 2-way differential resides at the front end while a Cusco 1-way differential sits at the back. Unlike most of the roads you’d find in the United States, Okuda’s local streets are smooth enough for more race-oriented suspension to still drive comfortably. In the interest of improving the Stagea’s handling ability without killing ride quality, a set of Aragosta coilovers replaced the factory suspension. The 13 kgf/mm front dampers and 6 kgf/mm rear dampers are each wrapped in Aragosta 8 kgf/mm springs. This configuration runs the car on stiffer suspension than factory, while the soft rear shocks help with weight transfer necessary for hard launches. Upsized wheels and tires help further to keep the car on the ground, making use of a set of 17×9-inch Volk TE37 wheels and Hoosier 275/40R17 tires. Given the car’s goals of hitting the drag strip, safety also came into play as part of the build. A Saito 6-point roll cage fills out the interior, adding rollover protection while still leaving the front and rear seats easily accessible. 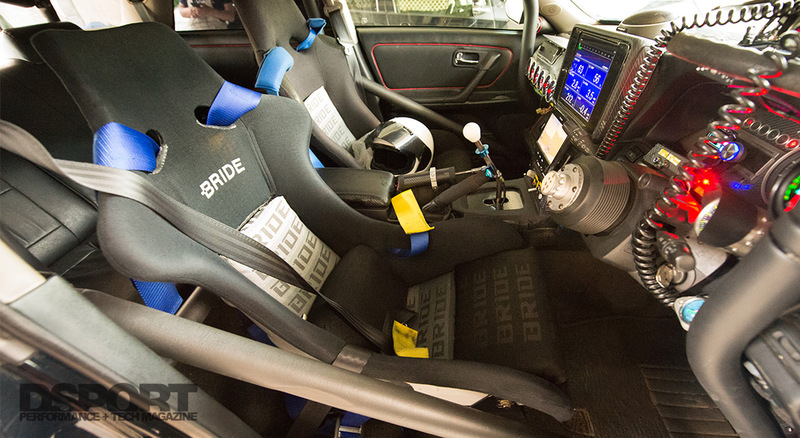 While the back seats remained stock, the front seats came out in favor of Bride racing seats and Sparco four-point harnesses. A Nardi steering wheel sits at the driver’s hands, held by a quick-release hub for easier entry and exit in the cockpit. While the Stagea packs impressive features under the hood, the car catches plenty of attention for what it flaunts on its exterior. The most distinctive element sits front and center, where an R34 GT-R front bumper assembly replaces the original Stagea front end. The unique looks are complemented by its Final Motion hood, Ganador mirrors, and Masa rear spoiler. With the paint and body work completed by NK Company, the end result is a truly unique Nissan build that blends the Stagea with the iconic Skyline GT-R body styling. Since the build was completed, Okuda has already taken the Stagea to the track to see what it could do. 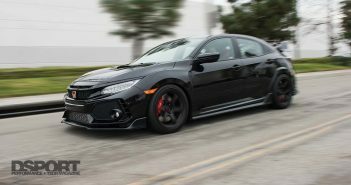 With a strong launch, 31psi of boost, and shifting gears at 9,200 RPM, he managed a 10.309-second E.T. at 149 MPH, with all signs pointing to the nines being very possible. The car’s performance was actually better than expected, tempting Okuda to build the car to be even more track-specific. Seeing that the car is still equipped with comfort features like air conditioning, entertainment, and a complete interior, weight remains as one major opening for performance potential. Soon enough, we’ll likely see Okuda trim the fat off this Stagea project in a search for the nines down the quarter-mile.